GAINLoyalty are proud to be enabling this life-changing service from WDP. 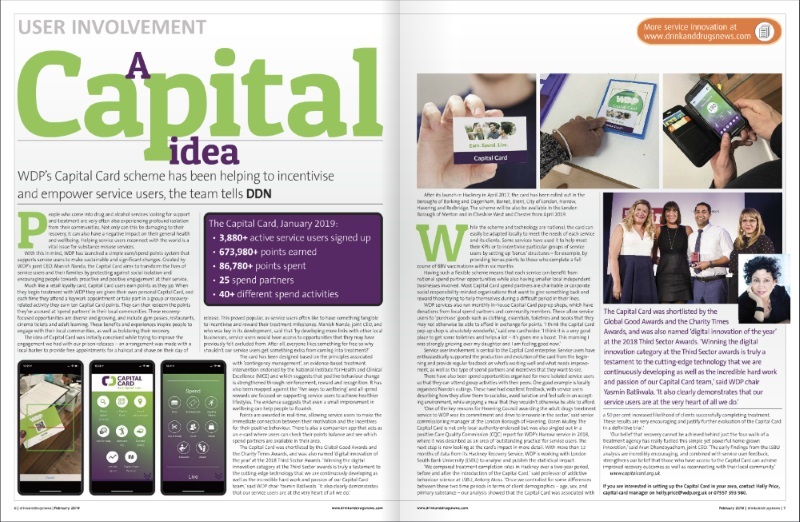 The Capital card has also been featured in the Feb 2019 edition of Drink and Drugs News which gives an in-depth overview of the service. Preminary finding by London South bank University suggest that the Capital Card was associated with a 50 per cent increased likelihood of clients successfully completing treatment. These results are very encouraging. After its launch in Hackney in April 2017, the card has been rolled out in the boroughs of Barking and Dagenham, Barnet, Brent, City of London, Harrow, Havering and Redbridge. The scheme will be also be available in the London Borough of Merton and in Cheshire West and Chester from April 2019. GAINLOYALTY has long supported businesses with the ability to sell their own gift cards over the counter.